This holiday season; keep an eye out for bacteria that can cause foodborne illnesses. Practice safe food handling techniques when entertaining during the holiday season to prevent food contamination. Wash your hands with soap and warm water for at least 20 seconds before and after handling food, after using the bathroom, changing diapers, or touching pets. Always wash fresh fruits and vegetables. Wash food-contact surfaces often. Bacteria cam spread throughout the kitchen and get onto cutting boards, knives, sponges, and counter tops. Keep raw foods separate from cooked and ready-to-eat foods to avoid cross contamination. Bacteria can easily spread from one food product to another, especially in meat, poultry, and seafood. Do not place cooked food back in a plate or cutting board that previously held raw food, unless washed with soap and warm water. Reheat any leftovers thoroughly to 165°F; food should be hot and steaming. Refrigerate promptly to keep most harmful bacteria from growing and multiplying. Refrigerators should be set at 40°F and the freezer at 0°F. Check the accuracy of refrigerator settings occasionally with a thermometer. Eat cold foods while they are still cold. Refrigerate or freeze leftovers within two hours in covered shallow containers. Discard perishable food that has been sitting at room temperature for more than two hours. You cannot tell whether food is contaminated with surface bacteria by the way it looks, smells or tastes. “Dinner parties and buffets are always very popular around the holidays. Foods that are left out for long periods can be an ideal setting for bacteria to multiply. 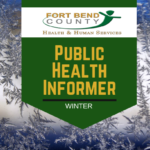 Remember to take special precautions to keep food safe for your family and friends,” said Dr. M. desVignes-Kendrick, Director of Health & Human Services and Local Health Authority. Properly label the package: “Perishable – Keep Refrigerated,” on the outside, and provide a complete mailing address and phone number to ensure proper delivery. Ship your package by overnight delivery. If food is sent via a mail-order company, be sure to specify overnight delivery, and request that the company supply a frozen gel-pack or dry ice in the packaging. This will help ensure that the food will arrive at your destination firm and refrigerator cold. If perishable food doesn’t arrive cold, don’t eat it, and notify the shipper immediately.